Dosai - even better "Masala Dosa", the very word makes me drool. I think that is the case for most of us. This is my most favourite "Comfort Food". Before coming to UK, I'd just run to Sree Annapoorna Gowrishankar in Coimbatore whenever I feel like it, especially when I am lazy to cook to have this super crispy dosa ...... those were the days of absolute luxury. I had to combine the post for dosa and masala dosa because you can't have masala dosa without the dosa nor the masala and I don't want to waste anybody's time by having two posts. Now for the Masala Dosa....This is the Basic recipe for Idli/Dosai Batter ......you can use either method for the dosa batter as mentioned in this post. 1.Prepare the required quantity of batter in a bowl [right consistency with the right amount of salt and sodium bicarbonate]. 2.Heat a flat griddle or dosa tawa on a medium high flame. 3.Pour a ladleful of dosai batter in the centre of the tawa and spread it in one continuous circular steady motion to form a thin round dosai. 4. Drizzle oil on the dosai and on the sides of the dosai. You will see tiny air bubbles popping up and bursting on themselves giving a wonderful "Bee Hive" effect to the surface of the dosai. The dosai is done when it becomes brown and crisp and will literally come away from the griddle surface. If the dosai is thin enough there is no need to flip the dosai, just make sure that all the batter is cooked on the surface. Green peas [cooked]: 100 gms. 1.Peel, chop and boil potatoes until soft. Mash and keep aside. Thinly slice the onions, green chillies and ginger. 2.Heat oil on medium flame in a kadai. Splutter mustard seeds, channa dhal and curry leaves. 3.Add the ginger and green chillies and saute for 1 minute. 5.Add the tumeric powder, salt, mashed potatoes and green peas. Mix thoroughly until everything is well combined. Garnish coriander leaves and keep warm until serving time. Note: The masala should not be hard and thick. It should be creamy and spreadable [make sure that the potatoes are cooked well]...lumps are allowed but only a few. I added frozen peas directly into the masala and cooked for 5 minutes. If you are going to give this to your kid, make sure you remove the green chilli bits from the potatoes. Place a crispy dosai on a plate. Keep around 3 tbsp of the masala in the centre of the dosai and spread the masala along the entire diameter of the dosai. Fold one side of the dosai onto itself. Fold the other side onto the dosai covering the first flap. Adjust the flaps and press gently so that they hold the shape. Carefully turn it to the other side, so that the flat surface faces the person who is going to eat the dosai. This is the best part ..... Don't wait for anything or anybody....just have a mouthful of this luscious dosa, close your eyes and drift off to heaven....Happy eating. 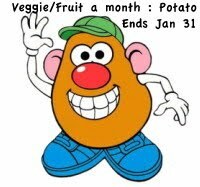 Sending this to the event "Veggie/Fruit a month -Potato" by Priya , guest hosted by Divya. My blogging buddies in this marathon: Gayathri , Priya Suresh , Veena , Jay , Srivalli , Ayeesha , Priya Vaasu , Usha , Soumya , PJ , Monika ....Lovely posts, check them out. simply... WOWWW.. the masala dosa looks awesome.. I just feel like having some right away Reva...The clicks are stunning...Lovely!! That dosa platter looks like from a restaurant around the corner..very nicely done Reva! Very perfect masala dosa.. Looks so inviting. Very beautiful snaps..
Am inviting myself to ur place, irresistible crispy masala dosa makes me hungry..
awesome clicks, pass the platter ! Omg! Your dosas are soo perfec.. love those brown rings in them.. kove the clicks too... needless to say.. mouthwatering..
will join u next time.. Perfect dosa, crispy and brown! I love masala dosa and that's my order whenever we go to Saravana Bhavan here in NY! Delicious Dosa!!! Drooling over the pics!!!! Ah, this is always a welcome food! Looks so tasty! Very nice cliks. Love the article about Biriyani.